Perhaps no kind of regulation is more common or less useful than mandated disclosure—requiring one party to a transaction to give the other information. It is the iTunes terms you assent to, the doctor's consent form you sign, the pile of papers you get with your mortgage. Reading the terms, the form, and the papers is supposed to equip you to choose your purchase, your treatment, and your loan well. More Than You Wanted to Know surveys the evidence and finds that mandated disclosure rarely works. But how could it? Who reads these disclosures? Who understands them? Who uses them to make better choices? Omri Ben-Shahar and Carl Schneider put the regulatory problem in human terms. Most people find disclosures complex, obscure, and dull. Most people make choices by stripping information away, not layering it on. Most people find they can safely ignore most disclosures and that they lack the literacy to analyze them anyway. And so many disclosures are mandated that nobody could heed them all. Nor can all this be changed by simpler forms in plainer English, since complex things cannot be made simple by better writing. Furthermore, disclosure is a lawmakers' panacea, so they keep issuing new mandates and expanding old ones, often instead of taking on the hard work of writing regulations with bite. 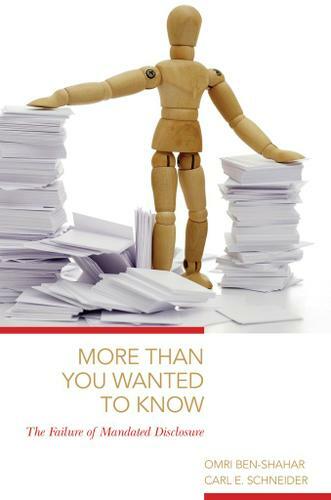 Timely and provocative, More Than You Wanted to Know takes on the form of regulation we encounter daily and asks why we must encounter it at all.